As the cost of education rises and demand for social workers increases, how can the profession attract and retain those concerned they won’t earn salaries that will help them pay off high debt? Increasing costs of a college education are generally recognized as problematic for the country, evidenced by the Obama administration’s many actions to address student loan debt. Draining the economy and deterring prospective college students, the cost of a college education funded primarily by loans has become a national social issue. At a recent meeting of the Campaign for the Future of Higher Education, student debt in the United States was estimated at more than $1 trillion. More than one-fourth of the country’s 40 million student loan debtors are in default on their loans, and by 2022, college loan debt will equal mortgage debt (Lisi, 2014). For present and future social workers, the costs of social work education are weighed against the debt burden required to obtain professional education. Faced with salary expectations that are typically lower than related professions, potential social workers may be dissuaded and practicing social workers may leave the profession. As social workers confront the dilemma of rising college costs and increasing college loan debt, the US Bureau of Labor reports that the nationwide demand for social workers will increase 19% overall between 2012 and 2022, with projected increases as follows: 27% increase in health care social workers; 23% increase in mental health and substance abuse social workers; 15% increase in child, family, and school social workers; and a 9% increase in all other fields of social work practice. In all, these projections indicate the need for 114,100 new social workers between 2012 and 2022. This growth is faster than the average for all occupations. In the first national study to examine the debt undertaken by MSW graduates, Yoon notes that in 2004, NASW reported an average loan debt for MSW graduates ranging from $30,791 to $47,094 for regular two-year programs, with one-year advanced standing graduates having loan debt between $28,816 and $36,728 (2012, p. 109). In 2007, the Council on Social Work Education (CSWE) reported an average of 72.5% of MSW graduates from 88 MSW programs amassed an average loan debt of $26,478 (Yoon, p. 107). The loan debt for master’s level social work education is in addition to loan debt incurred for a bachelor’s degree. In Yoon’s study, about 30% of respondents reported loans of at least $30,000 for the bachelor’s degree. Because graduates of CSWE-accredited BSW programs are eligible for advanced standing, one-year MSW programs, those who pursue this option typically have lower loan debt than those who attend traditional two-year programs (Yoon). Combining the costs of the undergraduate degree and the MSW degree, graduates often find themselves with loan debt between $45,000 and $60,000. Yoon’s study found no significant difference in debt amount related to “race, gender, parent’s income level, or mother’s or father’s educational attainment” (p. 116). The debt burden of social work education, when compared with typical salaries in the profession, may discourage potential social workers from pursuing this career path or cause those who have done so to leave the profession. Ray Cardona, NASW-NYS executive director, recently noted that financial pressures of living expenses, along with large student loan payments, and low incomes may cause social workers to leave the profession (Social Justice Solutions, 2014). These comments mirror the 2008 NASW report, “In the Red: Social Workers and Educational Debt,” which reported that education debt is a factor in recruitment and retention in social work. While student loans are a major method of paying for social work education, students also use other methods. Credit cards have become a source of funding for approximately 30% of social work students (Yoon). With generally higher interest rates and no grace period, credit card debt is an immediate burden to students and a lasting burden to graduates. A small percentage of social work students report using home equity or line of credit loans in Yoon’s study (p. 113). Beyond loans and credit cards, social work students cover the cost of their education through employment and grants or scholarships. On-campus, non–social work employment and off-campus social work positions can help finance social work education. Some social work students use grants and scholarships, including university merit–based and/or needs-based scholarships, and private or public agency scholarships, to cover educational expenses. Only a small percentage of all social work students receive such grants and scholarships, according to Yoon’s study. On the national level, efforts to address student loan debt have focused on loan forgiveness programs. A somewhat confusing array of programs, often unknown to social work students, has developed. Yoon noted that many social work students are unaware of the details of their loans’ repayment plans. In addition, the details of loan forgiveness programs are often daunting. A lack of publicity for loan forgiveness programs has resulted in underutilization. Federal programs for loan forgiveness, regardless of career type, include the Public Service Loan Forgiveness (PSLF) Program, originally available to those who made loan payments after October 1, 2007, under the William D. Ford Federal Direct Loan Program. Other loans, including the Federal Family Education Loan Program and the Federal Perkins Loan, or any other student loan program are not eligible. This program originally required borrowers to make 120 on-time monthly payments after October 1, 2007, while employed at a qualifying public service organization. These organizations include any federal, state, or local government agency, or a nonprofit, 501(c)(3) organization. On June 9, 2014, President Obama announced that he was using executive power to expand this program to those who borrowed prior to October 1, 2007, but not since October 2011. Under the PSLF program, the student’s choice of repayment plan is crucial. These include the Income-Based Repayment Plan (for those with partial financial hardship), the Pay As You Earn Plan (also requires partial financial hardship), and the Income-Contingent Repayment (for those not eligible for the Income-Based Repayment Plan or Pay As You Earn). Details of these repayment plans are provided by the US Department of Education Federal Student Aid Office at https://studentaid.ed.gov/repay-loans/forgiveness-cancellation/charts/public-service - what-is-the-public. Graduates intending to use the PSLF program need to file the Employment Certification for Public Service Loan Forgiveness, which will help track eligible employment for the 10 years required for the PSLF program. On the federal level, the National Health Service Corps Loan Repayment Program recruits health professionals, including LCSWs, to work in selected “health professional shortage areas.” In return, loan repayment, a competitive salaried position, and some tax advantages are provided. Additional information about this program is provided at http://nhsc.hrsa.gov/loanrepayment. Also on the federal level, loan repayment benefits may be available to master’s level social workers for careers in the armed services and service in AmeriCorps and the Peace Corps, which provide loan forgiveness or repayment programs appropriate for social workers. On the state level, loan forgiveness programs specific to social workers may be an option. For example, the New York State Licensed Social Worker Loan Forgiveness Program is offered to those working in critical human services areas. A total of 28 counties are represented, with fields of practice including health, mental health, substance abuse, aging, HIV/AIDS, child welfare, and multilingual communities. Efforts to expand this program are under way. Current funding is inadequate, as applications have far exceeded the number of awards available in 2013, according to NASW. The State Loan Repayment Program is part of the federal Health Resources and Services Administration’s Bureau of Health Professions. This program provides matching funds for states to establish their own loan repayment programs. The NASW website (http://www.socialworkers.org) provides a list of state programs for loan repayment to its members on the Loan Forgiveness homepage. As noted previously, social work scholarships are available from some universities. New York University’s Silver School of Social Work awards scholarships to 95% of its full-time students (http://www.scholarships.com). Other, nonuniversity-based social work scholarships are available to social work students; a Web search will identify sites with these listings. More difficult to identify, grants, assistantships, and fellowships may be available within specific colleges and universities, often for specialized projects. These potential resources frequently require admission to the social work program prior to applying for available positions. Yoon’s study showed that social work students use scholarships far less frequently than other sources of funding. Similarly, only 14.1% of respondents received graduate assistantships (p. 113). Paid internships were also a source of funding for 16.1% of study respondents. 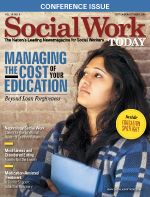 NASW, and the CSWE have recognized and responded to the problem of social work education costs relative to the comparably low salaries of social workers. As noted, the report “In the Red: Social Workers and Educational Debt” identified educational debt as a deterrent to the pursuit of public service careers and documented the debt burden of social workers relative to salary levels. NASW lobbyists regularly work to address these issues on Capitol Hill and were influential in securing student loan forgiveness as part of the College Cost Reduction and Access Act. CSWE also works to achieve loan forgiveness and more favorable loan repayment programs, and to link students with fellowships. Both organizations are actively addressing loan forgiveness and low salary levels for social workers. While these factors influence students considering a career in social work, other factors such as social workers’ safety, high caseloads, working conditions, and quality of supervision may dissuade students from pursuing social work careers or cause current professionals to leave the field. In September 2006, NASW announced an initiative “designed to unify and advance the social work profession.” In 2008, NASW engaged CSWE to jointly promote the Social Work Reinvestment Initiative. A major element of the reinvestment initiative, The Dorothy I. Height and Whitney M. Young, Jr. Social Work Investment Act (H.R.5447) was introduced in Congress. The primary goal of the Reinvestment Act is to secure federal and state investments in professional social work to enhance societal well-being. It also focuses on fair market compensations, high social work education debt, translating social work research to practice, social work safety, lack of diversity in the profession, and state-level social work licensure. Congresswoman Barbara Lee (H.R. 1466) and Senator Barbara Mikulski (S.997), both social workers, have reintroduced this bill several times, most recently in the 113th Congress. Social workers, social work students, and the social work community could benefit from the passage of this legislation. Considerable advocacy will be required if this bill is to be passed. The legislation tracking website http://www.govtrack.us reports that there is a 0% chance that the bill will be enacted into law. Until legislation such as the Social Work Reinvestment Act is passed, social work students and practicing social workers will continue to rely on loans, credit cards, and loan forgiveness programs to finance their education. Strategies for individuals addressing this situation include education about loans and other forms of debt. Many students take loans without understanding the terms and repayment options. Those using credit cards may not realize the long-term consequences and costs involved. Yoon has suggested that social work programs should offer this information to students and publicize loan forgiveness programs. A second strategy for individuals is to conduct in-depth research into available scholarships, assistantships, and loan repayment resources such as AmeriCorps and the National Health Service. Once MSW programs of interest have been identified, prospective students can fully investigate the funding opportunities that may be available through grants, research projects, and other projects that the social work program may sponsor. Using an informed and planned process, individuals can minimize the costs of social work education. Lastly, becoming familiar with loan forgiveness programs and repayment options is necessary. The Public Service Loan Forgiveness program must be fully investigated, and possibly applied for, as it requires 10 years of service in a public or nonprofit organization. State level loan forgiveness programs need to be explored as these may offer benefits to social workers. The projected demand for social workers will be met only if the cost of education for the profession is manageable. Present and potential social workers must be persuaded that the profession offers a path to financial security as well as professional satisfaction. While loan forgiveness may be one strategy, a more comprehensive approach as proposed by the Social Work Reinvestment Initiative is necessary. Exploration of possible tax strategies, income-contingent loans, and tuition reduction/scholarship development are necessary. The increasing demand for social workers projected by the US Department of Labor reflects the expectation of increasing need on the part of Americans. Meeting the human needs of people is the province of the social work profession. It is time to move beyond loan forgiveness programs and invest in comprehensive approaches to ensure an adequate supply of professional social workers. The question is: Can social workers advocate as effectively for the profession as we do for our clients? Lisi, M. (2014). Coalitions, student debt top CFHE agenda. The Voice, 41(5), 18-19. Social Justice Solutions. (2014). Social workers march on Albany to fight student debt. Retrieved fromhttp://www.socialjusticesolutions.org. Yoon, I. (2012). Debt burdens among MSW graduates: A national cross-sectional study. Journal of Social Work Education, 48(1), 105-125.